Today I joined the MD Trail Dames at the ATC in Harpers Ferry. 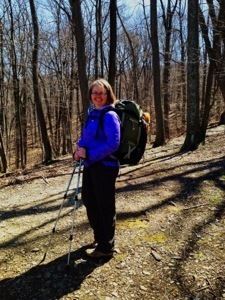 The plan was to backpack up to Loudon heights and back. The weather was phenomenal ! I thought the pack would be harder to carry. It was fully loaded! I was pleasantly surprised. As we started down the trail and crossed over the 340 bridge I was feeling pretty good. Then came the first big hill! I expected to be huffing and puffing, and I did get a little out of breath, but it wasn’t the horror I thought it was going to be! Now that I’m home I do feel a little twinge in my knees, but nothing very bad. I think I’m going to be fine! And now I’m ready to go on our backpack this coming weekend. We’re going to stay out Friday night and Saturday night down in southern Virginia on the AT, from Stony Creek down to Pearisburg. Should be an absolutely outstanding time! !